This list of Grocery Loyalty Programs with sign-up links is provided, because some Grocery Stores will give you their best sale prices, or an additional discount on some products when you use these cards. Many stores also allow you to load Store e-coupons, or other e-coupons such as Cellfire onto these cards, making your coupon shopping even easier. I’ve compiled a listing of over 55 Grocery Store Chains that offer these cards and links. Sign-up/enroll online for the cards for whichever stores you shop at. Stores with limited locations may not be listed. 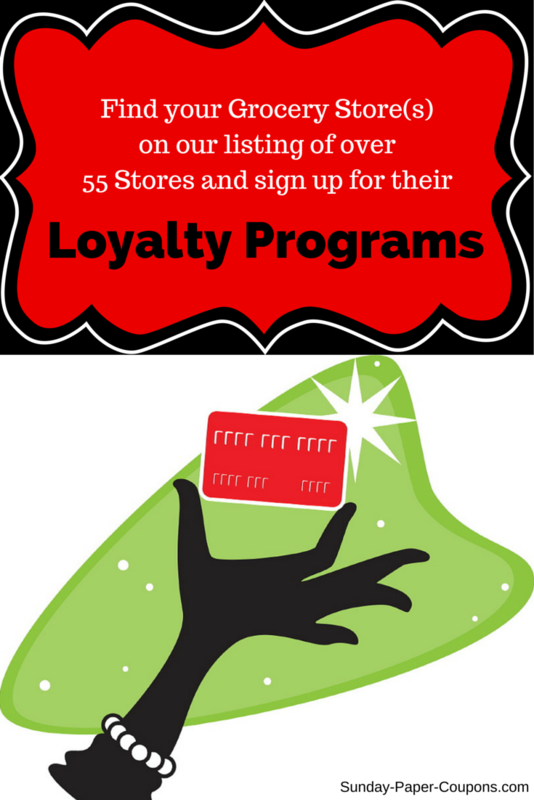 I will be adding to this list as I find more chains that offer Grocery Loyalty Programs. Store's call these cards by a myriad of names: rewards card, advantage card, shopper's card, club card, MVP card, value card, plus card, PERKs card, savings card, gold card, etc. They're all basically Grocery Loyalty Cards. You can save much more money by combining the savings from these cards with coupons. In addition to the coupon inserts that come in your Sunday paper, you can get many more free grocery coupons online right here.